What Flowers Work Best at District Winery? 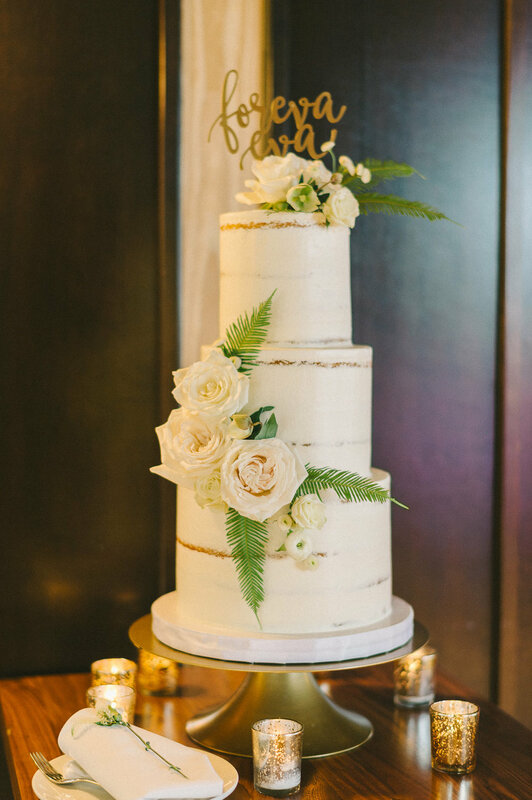 Featured in 2018-2019 Washingtonian Weddings Magazine! 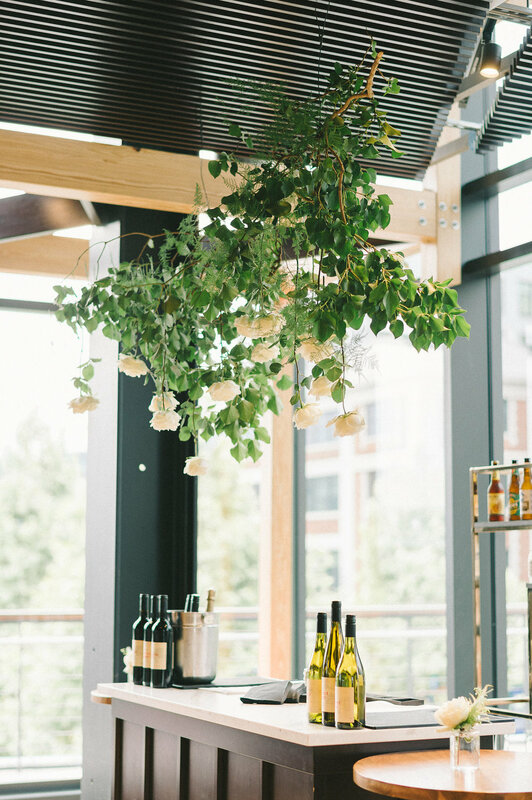 Originally, Sam was considering an asymmetrical hanging greenery installation for her ceremony, but ultimately decided to use the District Winery wine barrels. The wine barrels are great because they are sturdy platforms that support large arrangements with no surprises or worries about wind interference. For those of us working on rooftops, wind can be a really big deal and often spoils best laid designs. 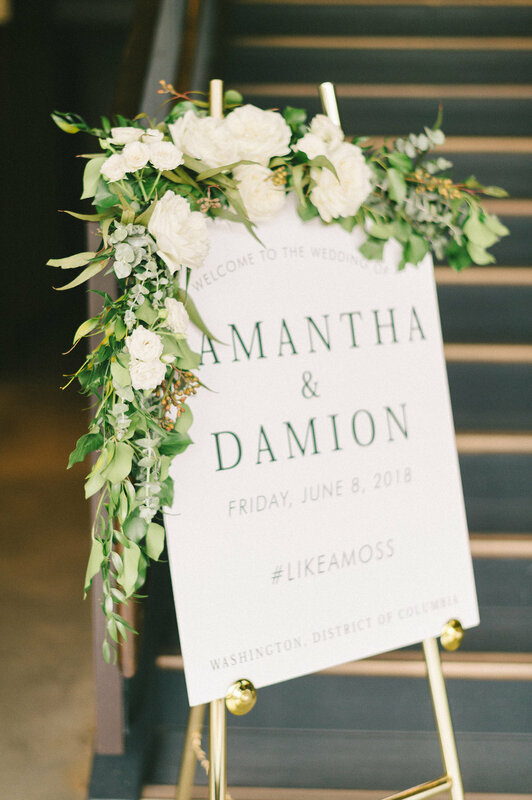 In addition, we lined the chair rows with boxes of greenery and delicate white flowers to help soften the modern ascetic and add a little romance. Looking at the photos by Liz Fogarty Photography you almost can't tell you are in the middle of downtown D.C.! District Winery has your guests enter from the ground level, so it is helpful to have signs directing the way upstairs. Part of the charm and appeal of District Winery is the modern industrial vibe complete with exposed steel beams and boards. From a floral perspective, the exposed beams and boards are fabulous because they make it easy to hang lightweight installations. Working with Natalie from Designed Perfectly Events, we hung two abstract greenery and flower focal pieces over each of the bars. When District Winery opened, they had custom tables built to accommodate as many guests as possible and maintain the chic urban vibe. All the food is served family style and the tables are extremely narrow. As a result, fat centerpieces are out of the question unless they are tall with a very small footprint. Broken garland is a popular choice among clients, but we opted for something a little more romantic. On each of the tables, we placed four groupings of tall stemmed glass floating candles with petite arrangements nestled to the sides. Personally, I was treated so well at District Winery that I am excited to design for them anytime I can! 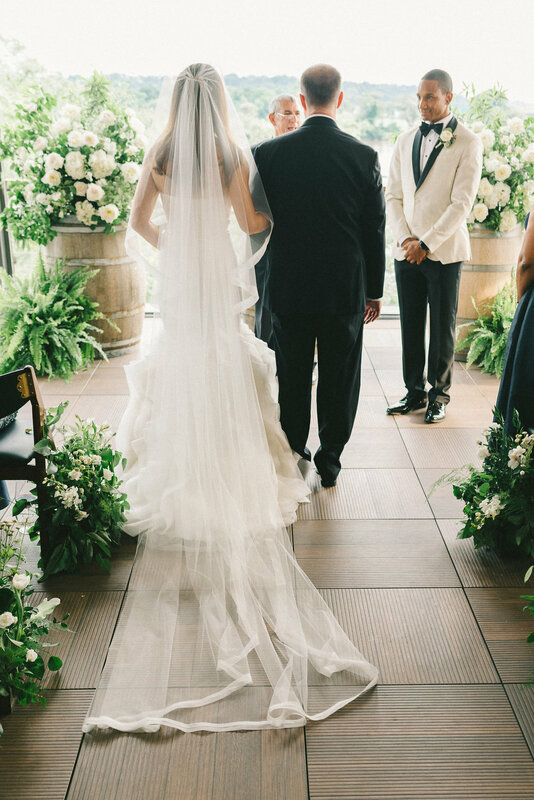 Now enjoy a few more of Liz Fogarty's photos from Sam and Damion's wedding because they are too gorgeous not to share! The best part about designing the aisle greenery in a box was that they were easy to move and reuse for the reception. I didn't even have to stay to do this, Natalie and the venue took care of it!